Extra deep, size 1 seat. Nutmeg and black embossed, angled back fixed giant high dressage flap with black wear strip. Nubuck Brown extra deep seat, size 2 with nubuck brown seriously straight dressage flaps. Extra deep, size 2 black embossed, angled back fixed giant high dressage flap. Extra deep, size 1burgundy, dark brown and black embossed fixed giant high dressage flap with black wear strip. Extra deep, size 2 black and grey double quilt stitch fixed giant high dressage flap with black wear strip with double white stitch on knee block. Extra deep, size 2 black and nutmeg with rust stitch angled back fixed giant high dressage flap with black wear strip. Deep size 2, black, embossed dressage moveable block flap with black wear strip and infill and white stitch on flap. Deep, size 1, black, dressage movable block flap with black wear strip. Extra deep, size 3, black, dressage movable block flap with Celtic Knot cantle infill. Deep size 1, black, VSD fixed block with blue stitching. Extra deep, size 2, oakwood seat with brown facings. Oakwood giant block flap with, angled back, Detailed white stitching of horse head design. 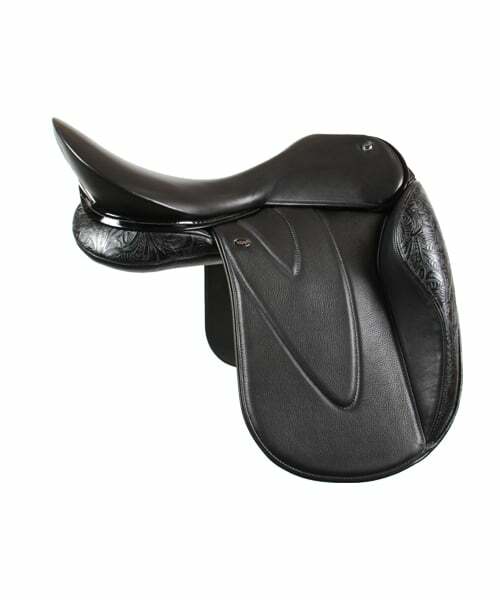 Extra deep, size 0 seat with black floral cantle plate and dressage fixed block flaps in nutmeg -1″ with black floral insert. Extra deep seat with embossed leather cantle infill, blue facings and giant high dressage flap with embossed leather infill and wear strip. Extra deep seat with embossed leather cantle infill and dressage giant high flaps with wear strip and embossed leather infill.